DRAWING INSPIRATION FROM ALMOST EVERY MUSICAL GENRE, THIS BRISBANE BASED GROUP GREW UP ON A STEADY DIET OF JOHNNY CASH, CCR, BOB DYLAN, LED ZEPPELIN, DIRE STRAITS AND BRUCE SPRINGSTEEN. THEY SAY THEY PLAY MUSIC THAT FEELS GOOD FOR THEM. THE RESULT IS A HYBRID OF ROCK, FOLK, AND INDIE - AS ECLECTIC IN ITS EXECUTION AS IT IS DISTINCTIVE. Silk ’N’ Oak, which began as a folk-rock duo in 2013, has recently undergone an evolutionary transformation into a five-piece alt. rock outfit in the short space of 5 months. Still fronted by brothers Rick and Troy Saunders, Silk ’N’ Oak has five east-coast tours under their belt, a bootleg self-titled EP, three singles, and they’ve hosted two successful boutique music festivals in South-East Queensland, Australia. Rick and Troy started gaining recognition in 2013, through their captivating live performances. Once they had had a taste of performing for captivated audiences the relentless touring began. They only took a break from the road to record their ‘early work’ in 2016. After years of performing as a Mumford-infused duo the boys had musical ambitions way beyond what they were generating as two-piece acoustic rock-show. It was as the boys were about to release their debut EP when their drummer for the show announced that he couldn’t make it to the gig. Fortunately the seed had been planted for a new young drummer by the name of Lachlan Holdorf a couple months earlier, when he and Troy acquainted themselves at a local party. “I gave him a call, and we was keen,” said Troy. Not long after, Lachlan’s older sister and multi-talented musician, Becc, soon became a permanent member after adding elements such as keys and violin to their live show, as well as their latest single What They Said. 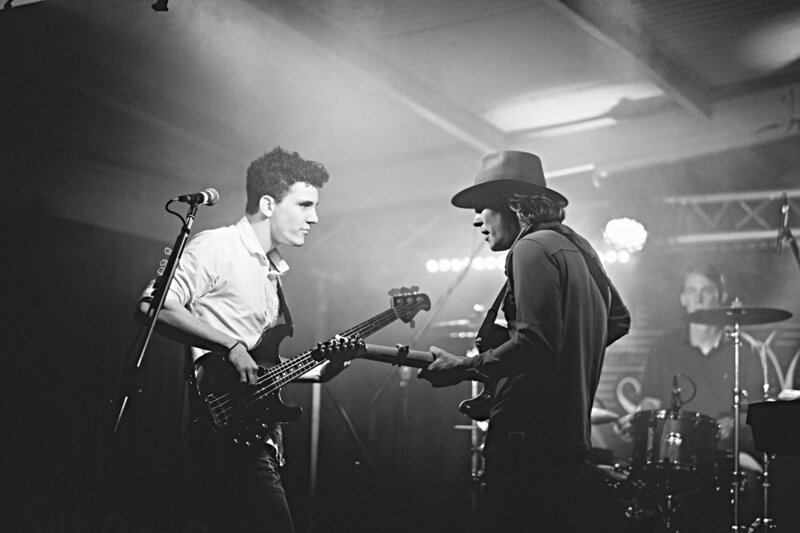 Although Rick and Troy grew up on a farm near Boonah, South-East Queensland, the majority of their shows were played in the nearby city of Brisbane and they eventually made the move there in early 2017. “Less travel time to and from gigs meant it was easier for us to play more, so moving there was kind of a no brainer,” claimed Rick. The Silk ’N’ Oak lineup was nearly perfected, however there was still one final piece missing. To locate it, all that was needed was a peak down the hallway of their newly established musical household. Which lead them to their lead guitarist Luke Martin, who swapped his bass to join the band in August 2017. Now after a successful 2017 and a band line-up just like Rick and Troy imagined, they plan to doing more of what they know - playing live shows, and lots of them. “We want to push ourselves this year, we want to gig more, we want to release more, and we want to write more,” said Ricky. This new possibility of music may sound exciting, but the boys didn’t get to this place overnight. Everything really started when I broke my femur at the age of thirteen. Whilst I was recovering, I was confined to my room and one of the only things I could do to pass the time was listen to and play music. However, I could only do so much by myself before boredom set in and that’s when Troy decided to set his gear up in my room so we could jam. This is where the idea of playing music together started. Fast-forward four or five years and we have a little band with a drummer and a keyboard player. I was on guitar and Troy was on bass. We played in a number of small competitions and local events around Boonah. This is where Troy and I first got used to performing live; we also got a taste of what it was like keeping a band together… Not easy. After some time, we decided that it would be worth a try rocking a two-piece up and down the east-coast. We were tired of relying on people that just weren’t interested. As well is this, Troy was just about finish high school – finally we were going to have free reign!! We endured months of emailing back and forth to book our first tour and then hit the road with a band called The ERT Trio. This band has been great, we’ve played shows and rockabilly festivals up and down the east-coast, and we’ve even opened Decades Festival, where The Living End and Cold Chisel played. So, we travelled with ERT as far as Melbourne. From Melbourne, Evan - our drummer - flew back to Brisbane while Troy and I boarded the ferry to Tasmania. We didn’t have any shows booked, but we did have tickets to our first Falls Festival in Marion Bay. There was a lot of hard work involved chasing gigs, busking and networking. We were almost entirely out of money and fuel when we got our first call from a little bar in Hobart called Irish Murphy’s needing an urgent fill in. From here we were able to make a number of other bookings and we filled our next two weeks with some really great gigs. When we returned to Queensland we started work recording our debut EP. This was a crazy learning curve for us as we had our release tour booked before we’d finished recording. As a result of this, we were feeling a whole lot of unnecessary pressure and barely managed to get it finished - only picking up our CD’s the day before our release. The EP consisted of the first songs I’d ever written. We basically wanted to get them recorded as a time-piece since we had newer songs that we were writing that we had taken more of a liking to. Our favourite part of the whole process was our EP launch show. We organised a music festival for our local town of Boonah, and hosted over 300 people. Unfortunately, the weather was terrible, it was blowing a gale and insanely cold and no amount of fire drums could possibly fight off the freezing wind. Amazingly, this couldn’t keep people away and the show was a huge success. We were fairly surprised as this was the first show we had ever organised ourselves and the first show that wasn’t at a typical music venue. We were relying purely on a word of mouth and our small following. It was a huge step forward for us. We call our festival The Silk ‘N’ Oak Show and our intention is to bring wonderful music to towns and cities where such events don’t often take place. There are thousands of these communities and we hope to get to all of them eventually. As with all of our festivals we wanted to make a difference. It was with this intention that we donated all of the funds raised to a local charity called Parkies Adventures. Chris Petherick, who has been battling Parkinson’s for over a decade now, started this charity to raise funds and awareness for those suffering with Parkinson’s Disease. In May 2017 we hosted our second music festival, once again in Boonah. This time we had beautiful weather and a crowd of over five hundred in attendance. Many people who hadn’t heard of Silk ‘N’ Oak came to honour the cause – this time raising funds and awareness for childhood cancer. Our first music festival - Urban Country Musical Festival 2015 & 2016. Our most fun music festival - O’Heart Festival 2018 (Tyalgum, NSW). Our other music festivals - Gympie Music Muster 2016, Decades Festival 2015, Airlie Beach Festival of Music 2017, Caxton Street Festival 2016. Successfully completing five East-Coast tours of Australia (Airlie Beach to Hobart), including Part 1 & Part 2 of our EP Release Tour. And the successful release of four music videos. In 2017 we met world renowned mix engineer, John Hudson of Mayfair Studios, London. We were able to work with him on our latest single, What They Said, and our newest project *secret* - which we haven’t spoken about yet. John is an extremely enthusiastic character who is open to anything that sounds good - if it’s an idea, he says try it, then decide - something that resonated closely with us. I will never get over chatting music with him, and it’s been a damn cool eye opener for us in terms of making great music. Now that we’ve put together and five-piece lineup we are stoked to get back on the road. It’s clear to see how much these farm-raised-Boonah-lads love pushing their limits, playing music, and touring. Best of all, they’re not showing any signs of stopping, or taking on a more placid lifestyle. The first three weeks of 2018 was spent in a homemade recording studio. They say it’s so they didn’t feel the pressure of studio time - hoping this would lead to some more honest recordings. Only time will tell us whether it worked. With a five-piece line-up one can only be excited for what might come.